For those of us who have been waiting patiently for the cinematic return of our favourite characters from the Hundred Acre Wood, the wait is now over and we have much to enjoy. Pooh Bear returns to the big screen with a lovingly crafted and carefully researched animated, 2D version from the Disney Animation Studios that manages to capture something of the wonderfully evocative, simplistic beauty of E.H. Shepard’s original illustrations. Walt Disney and Pixar Chief Creative Officer John Lasseter has attempted to remain faithful to the early Pooh animations from the 1960’s by moving away from the studio’s current dependence on computer animation and going back to the traditional, hand- drawn, 2D animation techniques of the past. 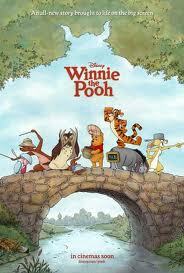 The story line is also a nod to the past, having been adapted from five A.A. Milne original short stories. Directed by Stephen Anderson and Don Hall, the new movie, known simply as Winnie the Pooh, is a back to basics attempt to capture the feel and sentiment of the original books, which any reader would recognize. Of course the movie is primarily aimed at a younger audience, and the uncomplicated story line is relatively undemanding, the characters stay faithful to their earlier depictions and effort is made to maintain the premise that Pooh, Eeyore, Tigger and friends are toys brought to life from the imagination of a young boy, Christopher Robin. The story finds the ‘bear of very little brain’ in the ‘mood for food’ as we have grown to expect, and led by this never ending appetite for honey, sets out to find some. However, Pooh’s quest is interrupted when he finds a distressed Eeyore, helplessly looking for his missing tail. The friends help of course and organize a contest to find a new tail for the perennially disconsolate donkey. 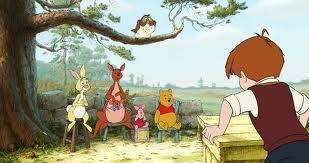 However, as we know all too well, anything can go wrong for the inhabitants of 100 Acre Wood and it usually does. Matters become complicated when due to the misreading of a message left by Christopher Robin, the friends mistakenly believe he has been captured by a creature called a ‘Backson’. The yarn plays out amongst the beautifully illustrated backdrop of English woodland scenery, and as if jumping straight out of the moving book pages themselves; the characters interact with the narrator (voiced by John Cleese), and with the very words of the story, misspelled of course, scattered around the scenery. The movie soundtrack features vocals from the actress/musician Zooey Deschanel and an original score by composer Henry Jackman with a number of original songs written by Tony Award winner Robert Lopez and his wife Kristen Anderson-Lopez. Enjoy this wonderful 2-minute trailer for the new Winnie the Pooh movie! Movievortex.com called it a 'a superb slice of family entertainment' and at only 69 minutes long, including the animated short 'The Ballad of Nessie' about a friendly Loch Ness monster; Winnie the Pooh will prove to be popular with the youngsters. With this return to the more traditional roots of A.A. Milne's classic children’s story, the effect, overall, is one of familiarity and nostalgia for those old enough to be acquainted with the original books, while at the same time, introducing the antics of our favourite characters Pooh, Eeyore, Owl, Rabbit, Tigger, Kanga, Roo, Piglet and Christopher Robin to a whole new generation. 'This will delight the wee'uns and put a smile on the face of animation fans of all ages' said Empire Magazine and so it does. ‘Winnie the Pooh’ opens in cinemas in the UK from April 15th 2011 and in the U.S from July 15th 2011. We hope you enjoy the wonderful new Winnie the Pooh movie.